Cycles of discontinuous gas exchange (DGCs) and abdominal ventilatory movements were studied in nurses of red wood ant, Formica polyctena, using an electrolytic respirometer and an infra-red (IR) gas analyser or flow-through respirometry. Both respirometry systems were combined with an IR actographic device based on IR-emitting and IR-sensor diodes. After recovering from handling and apparatus stress, lasting 1–3 h, completely motionless intact ants displayed regular DGC. After decapitation the ants displayed DGC whose frequency was somewhat lower than that of the intact individuals (7.17 ± 0.79 mHz and 10.43 ± 01.12 mHz, respectively). In headless ants, there occurred continuous slow movements of legs. Bursts of carbon dioxide in the intact and in the headless ants always coincided with a bout of telescoping movements (contractions) of abdominal segments, which was interpreted as active ventilation. 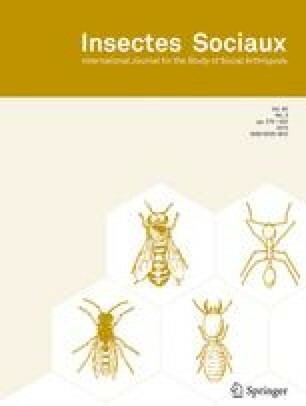 During interburst periods, the headless ants exhibited telescoping movements characterised by rapid protraction, lasting 0.07–0.09 s, followed by a slow retraction of segments, suggesting passive ventilation. The intact ants were very sensitive to the flowing air and tended to be continuously active during flow-through respirometry. The decapitated ants, on the contrary, were insensitive to the air current. Received 26 March 2003; revised 30 July 2003; accepted 6 August 2003.